I have a thing for watching film adaptations of books -- and then reading the book after. I absolutely hate horror movies. I will not sleep a wink if I watch them. After I saw "The Exorcist," I couldn't sleep for two nights straight. While I don't like horror films, I especially detest horror films that have a religious/demonic subtext. Those freak me out the most!!!! I never liked watching animated movies as an adult -- until I met my boyfriend. Now we watch animes all the time! I have a thing for movies from the 1980s -- the cheesier the better. I have never seen a movie in the theater by myself. One of my favorite 1980s films! 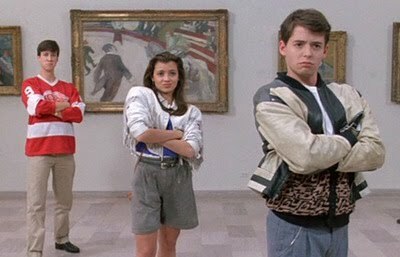 "Ferris Bueller's Day Off." Awesome, awesome movie. Do you have any confessions you feel brave enough to share? I can TOTALLY relate to the book thing. Since book-movies are usually not true to the books, I love being entertained by the movies, and having the extra satisfaction of reading the book. For me, at least, it eliminates the whole anger at having left stuff out. Which I guess is why I was angry at Order of the Phoenix (which I was still reading when I saw the movie) but absolutely loved Half-Blood Prince. i watched twilight over and over again when it came out! This makes me feel like one of those horrible screaming girls.. its just rpatz fever! I can totally relate with you and Abel about the book/movie thing. I think it's because usually how a story is told, not the story itself, is what really matters. Also, I always find out about books through their movie adaptations, and while I can't shake feeling a little cheap about it, it's how I find some of my favorite books (like Atonement). I've noticed I have a particular thing about movies based off of books... I hear about a movie, find out it's based after a book, then immediately try to find the book so I can read it first. Not only do I get the original take, but in some cases it might even expose me to stuff I wouldn't normally look into. Hello, from a fellow Miamian! I've watched Clueless about 20 times. Watching movies in a theatre by myself is my favorite! I'm with ya on the horror films...can't do it. I love to go to the movies alone...weird. I know.